n my previous reviews of products of American company ModWright I explained in detail why it belonged to my favorites. Long story short – it's a reasonable company that has been delivering high quality products from the very beginning (although new product are getting better and better) and it based its success on talent and knowledge of its designers and engineers. Pricing of ModWright products is also very reasonable and it is achieved through something I call “smart savings” despite the fact that almost every element of each of their products is made in USA. What are “smart savings”? For example: same metal casings used for more than one product, also all are made in one color and while there is a black option, customer has to pay for it extra, the design itself serves purpose – for that it doesn't have to look fancy, and so on. 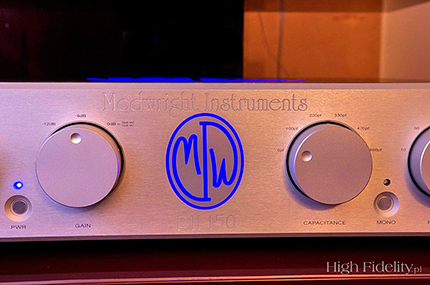 That is why I use two ModWright products in my reference system (LS100 preamplifier and KWA100SE power amp), plus an Oppo player with full tube modification done by Dan Wright (ModWright's owner). 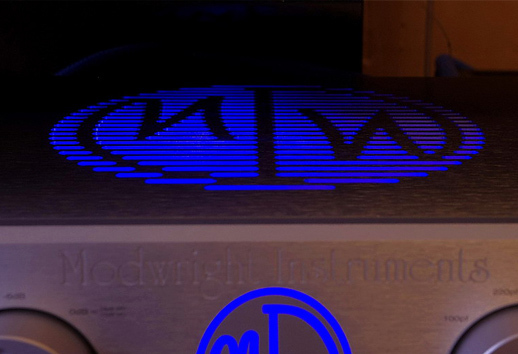 I simply appreciate ModWright's approach to audio business and I love the sound these devices deliver. When I planned my trip to Munich for the HighEnd Show in 2013 I came across an information that Dan was coming to Munich too (he'd never been to Poland so Munich seemed to be the only place to meet him). I didn't waste any time and contacted him to set up an appointment. Dan told me he was coming but in fact to the other Show that took place at exactly the same time – HiFi Delux in Marriot Hotel. That told me that his approach to shows was as reasonable as to everything else. This show might not be visited by as many people as HiEnd, but it is exactly what makes this show more private, less crowded and... surely less expensive to attend. We sat down together with Dan and Kristin Rose Boyd, ModWright's Executive Director of Operations, sipping a very nice, cold Weissbier and talked for almost three hours about many interesting topics. One of the “topics” I was particularly interested in were phonostages. ModWright had offered one stand-alone before, in my opinion a very good one (as far as I know one of Polish reviewers still uses it today), but some time before our meeting Dan had stopped offering it. Shortly after that two other phonostages were added to the portfolio but only as optional cards to be installed in KWA200 integrated (a simpler, solid-state version), and in my LS100 preamplifier (more advanced tube one). Dan explained the differences between them, as they were not that obvious to me and later told me he was already working on a new stand-alone model. He wasn't sure though how long would it take to finish it and he wasn't ready yet to dwelve into details of this project. During out conversation we focused on another idea instead. Dan was wondering whether or not he should design a cost-no-object amplifier. Such a product wouldn't really fit into company's profile but the idea was to show, that ModWright was capable of creating such product. Why do it? To change the way this brand was perceived by some audiophiles. It's a fact, although not every person would admit it, that many audiophiles perceive products, at least partially, through their prices. For them ModWright products are to cheap, ergo – unworthy of their attention. 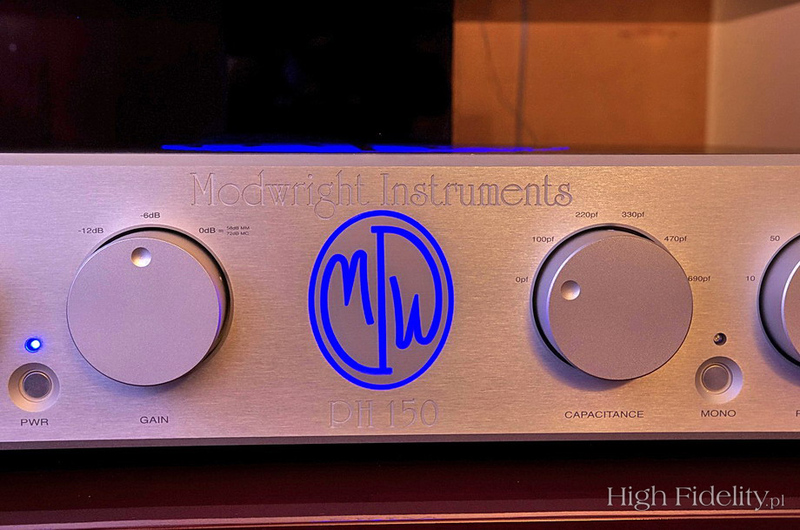 So such a cost-no-object amplifier could change the perception of ModWright brand, so that it would no longer be a hi-fi manufacturer (maybe knocking to high-end's door) but a “true” high-end maker. Those who gave any of Dan's products a try already know very well, that he offers a real bargain. Whether one calls is high-end or hi-fi doesn't really matter, what matters is excellent performance, much better one could expect looking at the price tag. As far as I know this project is still, at best, at its early stages, but some time after our meeting a rumor spread about new phonostage and D/A Converter that Dan was planning to release in a near future. I saw both of them, and listened to them for the first time in Munich, during High End (DAC Elyse) and HiFi Delux (phonostage) Shows. And I met Dan and Kristin again and spent few hours having another interesting conversation with them. But I'll save most of this story for another time. The new stand-alone phonostage, that I finally received for a review, is called PH 150, but the manufacturer adds also a proudly: a Reference Phonostage. We talked about it with Dan in Munich and he was very clear about both DAC and Phono – he and his co-workers had worked very hard, using all of their knowledge and experience to create the best devices possible. PH 150 was designed with quality and performance in mind and not with whatever maximum cost or assumed price level. As a result both products are, as for this brand, quite expensive. They are in the same price range as ModWright's top of the line power amp. After Dan told me that all I could do, was to demand getting review samples as soon as possible. It took some time but I finally got first of these two new products for a review (thanks to a Polish distributor, of course), the PH 150. In fact I received one of two units that arrived in the first shipment from US. That's why my unit was almost brand new. One of the things you need to know about Dan's devices is that they need quite a long break-in period. One has to be patient before ModWright delivers its optimal performance. I experienced that with both my units – LS100 and KWA100SE. Mr Maciej (Polish distributor) told me, that this unit had only several hours of work on it so I would have to give it a lot of time before it would really break in. I waited so long to get my hands on PH 150 that I didn't want to wait any longer. Well, there is one problem with breaking a phonostage in. It is difficult to loop a record, say for a week or two... Unless one has a special break-in record (from Clearaudio for example) one has to play record after record after record after record... And all that while performance is far from optimal. PH 150 spun records for maybe 50-60 hours before distributor picked it up to present it (on static display) during AudioShow 2014. My first impressions were quite positive, but, to be perfectly honest, I couldn't really hear anything yet, that would allow me to name PH 150 a Reference Phonostage. One should expect much more considering the price of the device, and I was expecting more after what I heard during presentation in Munich (despite far from optimal show-like acoustics of the room). Fortunately I was aware of the fact that this phonostage needed another 100 or so hours to show me it's best performance. Soundclub (distributor) knew that too and that's why the phonostage did not come back to me right after the AudioShow but a few weeks later, after a full break-in period. Frank Sinatra, Live in Paris, Mobile Fidelity MFSL 2-312, LP. Dead Can Dance, Spiritchaser, 4AD/Mobile Fidelity MOFI 2-002, LP. Cannonball Adderly, Somethin' else, Classic Records BST 1595-45, LP. Albert King with Stevie Ray Vaughan, In session, STX-7501-1, LP. Vivaldi, Le Quatro Stagioni, Divox/Cisco CLP7057, LP. Pink Floyd, The Endless River, Parlophone Records 825646215478, LP. Rodrigo y Gabriela, 9 dead alive, Rubyworks RWXLP110, LP. Buddy Guy, Living proof, Silvertone Records 88697-78107-1, LP. Lou Donaldson, LD+3, Blue Note Stereo MMBST-84012, LP. Let me start with a short description of the PH 150. As I already mentioned it is a phonostage and now I should add that it can work with MM and MC cartridges. As anybody who knows Dan's previous designs would hope for, this is a tube phonostage (with 2 x 6C45 and 2 x 6922/6DJ8/7308), and with external solid-state power supply. A maximum gain for MC carts is 72 dB and for MM it's 57 dB, which combined with adjustments available for both kinds (3 steps for: maximum gain, and attenuated by 6 and 12 dB) allows to chose optimal gain for any cartridge available on the market. Front panel controls (large knobs) allow user to adjust also input impedance and capacitance to optimize these values for a particular cart. Two other knobs are used to set a type of cartridge (MM or MC) and to choose gain level. One of two small push button is an on/off switch (an external power supply doesn't have its own), and „mono”, used if one wishes to play mono records. Back panel sports two inputs (separate for MM and MC), ground pin, two outputs (a fully balanced one and unbalanced), and two small toggles – one is an input selector and the other allows phase switching. There is also a multi-pin power inlet that connects, via attached umbilical, with external power supply. PH 150 sports “classic” ModWright's aluminum casing, with a small blue backlit logo on front and a much larger one on the top. Dan keeps casings of his devices solid, rigid and simple, although I noticed that with these new devices he introduced some subtle changes – like the beveled edges – that make them look much better, at least in my opinion. The casing of external power supply is also finished in a much nicer way than power supply for my modified Oppo. In fact the main “upgrade” (in terms of looks) is a thick front panel, nicely finished and with engraved writing that says only: PS 150. This change seems like not much but my power supply sits behind rack while PS 150 could be placed next to PH 150, as it looks equally good as the main unit. The standard finish is natural, brushed aluminum. Those who prefer black finish have to pay extra for it (poor me!). This device is another proof that Dan puts function before looks. Using large knobs placed on front panel for all important settings and adjustments is really comfortable – that is a huge advantage of this ModWright compared with most competitors equipped with small dip-switches often placed on the bottom of the device. But having four large knobs on the front panel... well, let me put it this way - PH 150 is unlikely to win a beauty contest. Two large knobs and two much smaller ones, or four much smaller ones would increase it's chances dramatically. In my honest opinion, of course. But from my perspective it doesn't really matter as I belong to those audio freaks who look for the best performance and not for beauty contest winners. Also, as for all other Dan's products, I prefer black version – but again, that's just me. I must admit though, that the silver version I got for the review looked better than any other silver ModWright I saw before. When I got PH 150 (for the second time as I explained before) I had my favorite quite inexpensive cart mounted on Terminator tonearm – the Audio-Technica 33PTG. I did realize that ModWright deserved a higher quality partner, but since it was late afternoon, and I felt bit tired I decided not to replace 33PTG just yet. Few well known (to me, I mean) records landed on the platter one by one in more or less the same order as during my first meeting with this phonostage couple of weeks before (when it wasn't performing that well just yet, as it wasn't broken-in). Even taking into consideration how unreliable our sound memory is I was damn sure of significant improvement of PH 150's performance. In fact, I didn't think I'd ever heard 33PTG to perform that well with any phonostage. It is true that usually I conduct my tests of high-end phonostages with my other cartridge (Koetsu Black), but at least some of them for some period of time played also with AudioTechnica and it often performed really well with them, but not as brilliantly as now, with ModWright. A very smooth, liquid, rich and open sound – that's what I heard while listening to the last Pink Floyd's album. Audio-Technica usually tends to deliver a slightly dark sound. With ModWright AT surprised me with amazingly vibrant, lively but also rich treble. Tone of percussion cymbals was bit deeper then usually but also more “metallic” which I liked a lot, and with a nice, long decay. Sound seemed more detailed – an operative word here being “seemed” (compared to my phonostage's presentation) as the same stylus couldn't read more information from record's groove just because it sent signal to a different phono. So in fact the same number of details was presented in a more noticeable way. The general sonic character of 33PTG did not change compared to what I knew from everyday's listening sessions with other phonostages – it was equally smooth, liquid, involving and simply easy to listen to, but the few above mentioned additional qualities made AT sound better then ever and play music in a most beautiful way. Yes, I do realize, that any phonostage, including ModWright, at this price range is an „overkill” for this AudioTechnica. PH 150 should and will be surely targeted by owners of much more expensive cartridges. In fact the moment I switched AT for my Koetsu Black I started to regret that I didn't ask Soundclub for my absolutely favorite, dreamed cart – AirTight PC3, which, as I'd found out during my test of it, was a perfect partner for my Salvation deck with Terminator tonearm. Also in terms of price level it would fit ModWright even better than a basic model of Koetsu. Someday PC3 is going to be mine, until then I'll keep enjoying my very nice Koetsu. This Japanese cart has in fact a similar sonic character (like 33PTG), although at different, much higher performance level. As it also offered a bit warm, rich, smooth sound, the question was whether combining it with a tube phonostage wouldn't result in too warm, too round, too syrupy sound. I found out very quickly that it wouldn't! Quite the opposite, I might say. What caught my attention from the very beginning was how open the sound seemed and what an outstanding spacing this setup delivered. These two sound qualities came mostly from treble and upper midrange. It actually was the amazingly rich and open, smooth and detailed, with no sign of roll-off, treble that distinguished ModWright from most other phonostages I'd listened to in my system. 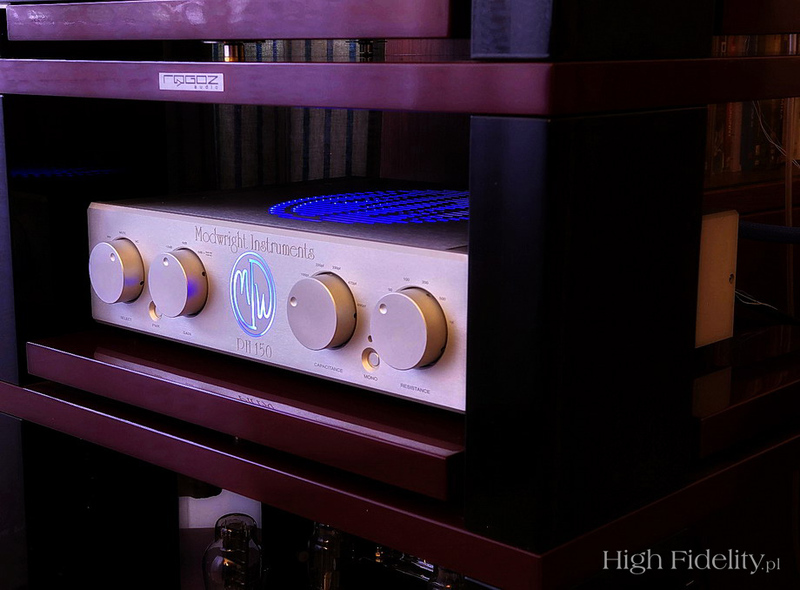 There were others that extended treble equally well to the very top of the range but none of them combined that with this amazing richness of high end, which in turn made them sound a bit “dry” and thus not so naturally as PH 150 did. Tubes used in preamplifiers (linear or phonostages) usually offer something that (most) transistors can't – this amazing airiness of the sound, its openness which results in remarkably spacial presentation. My own ESE Labs Nubiru, or the brilliant Trilogy Audio 907 might have been bit more resolving (although I wouldn't bet my life on it), but I liked, especially with acoustic recordings, ModWright better. It delivered more of this acoustic aura, ambiance around acoustic instruments, it felt like there was more of the vibrating air surrounding them, and since it was the air that transferred vibration/music to listener's ears, it sounded better, more natural. Also a decay phase very well presented by both above mentioned solid-state phonos, now seemed bit longer and fuller. It seemed to come effortlessly (if I can call it that) to PH150 to show proper proportions between guitar or double bass strings and wood. These two crucial elements came together in a very smooth way creating a wonderful, inseparable, very natural sounding whole. Did it mean that Nibiru or Trilogy did same thing in a wrong way? Hell no! Both did a fantastic job, too, but both are much less expensive wonderful pieces of equipment, and ModWright just showed me that paying much more was surely worth it. That's the essence of our hobby – we spend more and more money and it buys us better and better performance (although at some point of the way up next steps become smaller and smaller while costing more and more). Usually (maybe except for the very first experiments most of us perform as the beginners) – we have a very well sounding systems and we don't really miss anything in their performances, we love them, at least until... we get to listen to some new, better performing component or a whole system and then we realize that our system could sound even better. It will costs us twice as much to get this better performance, but it is worth it! Anyway – direct comparison with these two damn good solid-state phonostages I had at my disposal at the time, plus every other phonostage I'd ever reviewed, proved beyond doubt that Dan Wright kept his word. He created, as he said, the best phonostage he knew how to make, it in my opinion it was a fully justifiable thing to do, to call if a “Reference” one. And he priced his creation accordingly. Treble is surely not the only part of the range of interest but before moving on I have to go back for a minute to one of its aspects – to how spacial that presentation was. I have to admit that this aspect of presentation is very important for me. Soundstage is one of its elements and PH 150 delivered impressive width and depth. The second element is imaging – and ModWright created wonderfully palpable, three-dimensional images – instruments and vocalists that actually had body, and each of them was precisely placed somewhere within width and depth of the soundstage. These images/instruments not only were extremely palpable, they interacted with each other – like during live performance when it is not just about static picture of five instrument of the stage, but about so much more, about how musician interact with each other, how they together create the sound that arrives to our ears. And finally there was one more thing about this presentation, usually attributed to the speakers, but since I could compare few phonostages in exactly the same system I realized, that PH 150 also should have received part of the credit for speakers completely disappearing from my room. Speakers were simply not there – there was music and me and nothing else in the room especially when it came to live recordings when musicians and vocalist were “present” in the room in front of me.